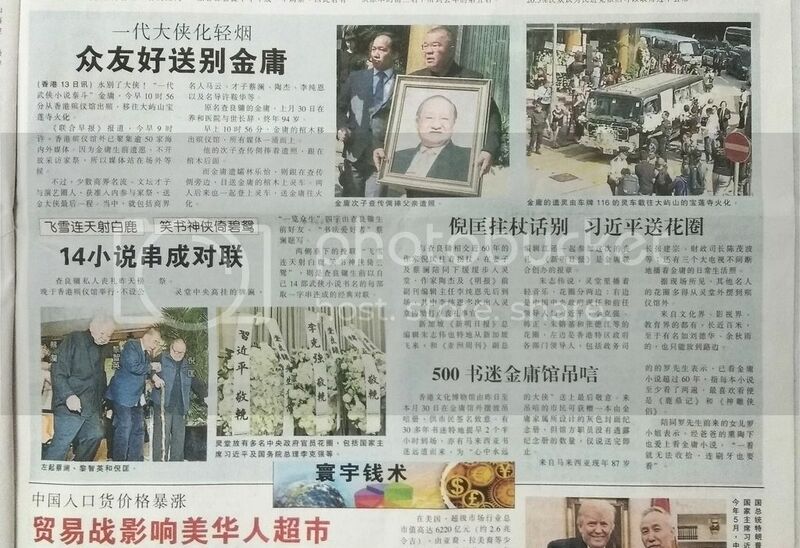 It was Jin Yong's funeral the other day, and this came out in my local newspaper. 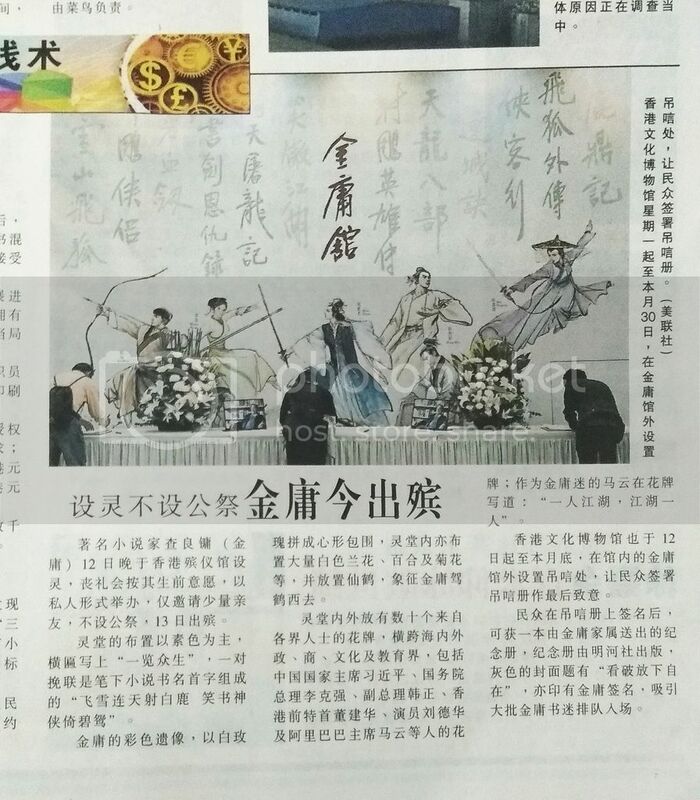 The above article mentions that the couplet composed using the first character of 14 of Jin Yong's books were prominent in the funeral. 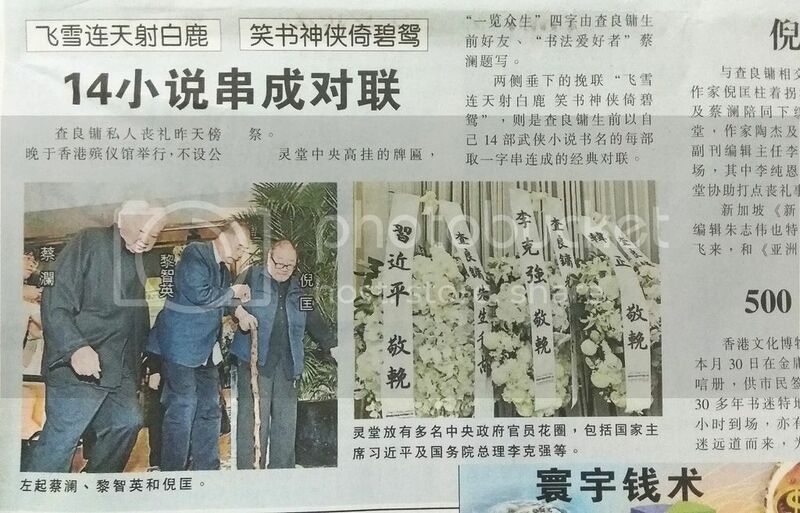 This article states that Jin Yong's good friend, Ni Kang was at the funeral, supported by his cane. China's Premier Li KeQiang sent a wreath, as did China's President, Xi JinPing. In accordance with Jin Yong's instructions, his funeral was a private affair, with only selected people invited. Ni Kang was one of them. Ni Kang ghosted for Jin Yong in the story, Tian Long Ba Bu (Demi Gods and Semi Demons) when Jin Yong had to be away from Hong Kong for an extended period. 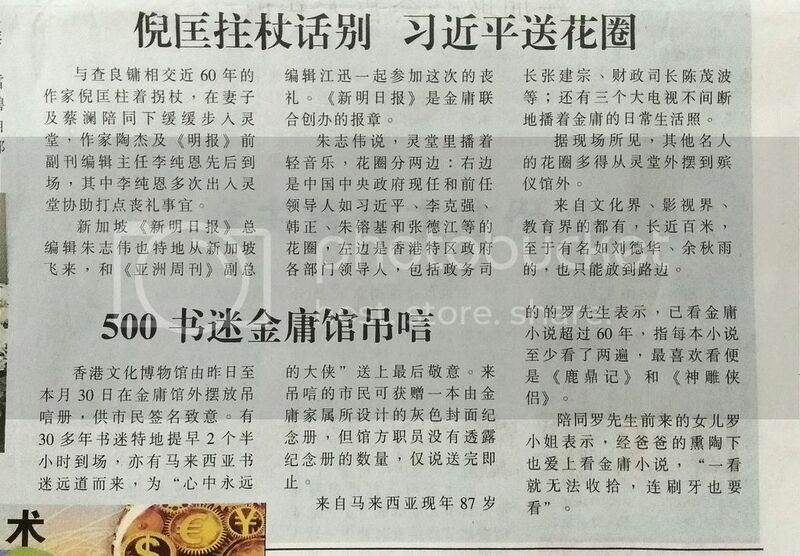 This story was a daily feature in a newspaper, Jin Yong's story was publish at the same time as he wrote it. As Jin Yong's funeral was a private affair, his fans turned up in the Jin Yong Gallery in Hong Kong to pay their last respects. For someone who had stopped writing more than 4 decades ago, Jin Yong's cultural influence remains incalculable. I didn't even know Huang Yi has died until this year. By the way, was Jin Yong cremated? Or buried? Here's a tribute from an American reader, Sara K., whose blog I enjoy reading. She reads Chinese and has written a number of blog posts on Jin Yong, her favorite Chinese writer. kyc i can feel the groans reverberating around the world from all the guys on the forums bemoaning another fangirl of YG and shendiao, LOL! thanks for sharing the blog! siuyiu, Sara K. has written about Huang Yi, Wang Dulu and Zheng Feng. She has read more wuxia novels than I have. Another article she wrote worth reading is www.hackingchinese.com/a-language-learners-guide-to-wuxia-novels/. She also writes for Manga Bookshelf (http://mangabookshelf.com/author/sara/). For someone who had stopped writing more than 4 decades ago, Jin Yong's cultural influence remains incalculable. I have only read Jin Yong's and Gu Long's wuxia books. I agree, Jin Yong's cultural influence is deep. His books show more of the traditional Chinese values of Loyalty and Uprighteous compared to Gu Long's. I understand Ni Kuang ghosted for Gu Long and on one occasion, for Jin Yong. But I think Ni Kuang is more well known as a sci-fi writer. I seem to recall Ni Kuang having written wuxia before, but now with too much success. Ni Kuang, however, adapted many of Gu Long's stories for the big screen. I must confess I had watched many of them. Ah, my misspent youth! According to the newspaper I read, Jin Yong was cremated. Ni Kuang's wuxia works are kind of more focused on movie scripts, such as The One Armed Swordsman. His IMDB page has an extremely long list of films. 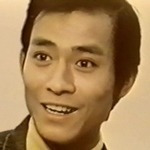 His wiki page has some novels listed in the "Other" section, though not all of them are wuxia. Ni Kuang was ridiculously prolific... between writing fiction, bringing up his kids and ghosting for Gu Long, he also wrote a great number of film scripts. Take note of the year 1976--he wrote 22 scripts! By the way I visited my local library today and had a big shock. The Jin Yong shelf usually has two copies of his every novel. Today, all I saw was a single copy of Bixie Jian. Every other copy has been borrowed out. Singaporeans have a change of heart? They are reading more Chinese? I think almost 80% of the Shaw Brothers' wuxia movie scripts were written by Ni Kuang. Been watching a lot of wuxia adaptations from Shaw Brothers this year and I always saw Ni Kuang's name as scriptwriter. I actually watched a Ni Kuang-scripted Shaw Brothers movie, Return to the 36th Chamber, starring Lau Ka-fai, today. It was entertaining if a little slapsticky. I had originally wanted to watch Part 1, i.e. The 36th Chamber of Shaolin, but after the movie started I realized the first movie was only available in an English dub, so I switched over to its sequel. Return to the 36th Chamber is a sequel in name only. The two films are not narratively related. Ni Kuang was credited as the sole screenwriter on both movies. I'll try and watch The 36th Chamber of Shaolin soon, as well as Killer Clans--the latter probably before the end of this year. You shouod enjoy Killer clans a lot. Superb plot, costumes, fights ! I enjoyed everything ! And if you watched Adam Cheng's series Meteor, Butterfly, Sword, it should ring a bell to you. The first time I had watched the Shaws' movie, I was a little bit lost by the plot, but after watching Adam's series and then Killer clans again years after, it helped me to understand some parts of the plot that had escaped to me at the first viewing. kyc thanks for sharing screenshots of the stamps! Lucky you! I tried to order them direct, but they were sold out.